1) I am not a fan of textbooks. 2) I am a fan of Apple products. One reason I’m not big on textbooks is that it is often limiting, and the content is often produced in a linear way, even when it doesn’t have to be. Don’t get me wrong, I think text books can be a useful resource, but they should be used sparingly, and teachers need to customize their content with what works for their students. The few interactive texts that they are selling have some neat features, but they’re nothing to scream about. Resourceful students and teachers have been able to get that kind of content for free on the web. They’re better than the textbooks I used in high school, but the classes I learned the most were ones where teachers made us read articles in newspapers, periodicals, and literature. The part that excited me most about Apple’s announcement was the “ibook author” that one could download for free from Apple. I played around with it this weekend to see if I could easily create ebooks, but more to see if it would be easy for kids 8 years old and up to use. The answer to that question is yes. Here’s the problem: we’re not an Apple computer school, let alone an iPad school. A few of each float around, but not in a supply that would be accessible to most kids. One of the reasons I like Apple products is because they often just work right. They are well-designed in the sense that they do what they are supposed to do simply – use other software if you want to do more complicated things. The work well (most of the time), but that’s often only when you play within their own ecosystem. If a student or I create an ebook (whether or not it has any interactive features), I want them and their peers to access these books in a myriad of formats such as a web browsers, Kindle, any pc or tablet. I can’t see myself spending time creating ebooks for my students that only work on one device unless a school adopts that device whole heartedly, and I don’t think right now they should. It’s too soon. There are many things great about an iPad. I’d be happy to get rid of the pcs in my room, reclaim that work space for students and have them use tablets at their tables, the rug, etc. Still, for little kids, I think it’s too soon. Perhaps, when I find the time, I’ll post a pros and cons list from what I’ve found in using an iPad in the classroom. It’s promising for starters, and a bit more engaging than a standard textbook (which as I’ve mentioned I’m not a fan of), but for now, it’s just another delivery method for standard textbooks. It’d be great to have me or my students create ibooks, but with no macs and 1 iPad in my class, I’ll stick to creating web resources, and hopefully having kids create web resources for each other, as well. Those they can access anywhere online. I may change my mind, but for now, I’m underwhelmed. You can watch Apple’s video/ad below. In the news this week, Indiana’s Department of Education announced that schools would no longer need to teach cursive penmanship in schools. They would, however, let schools decide for themselves. It’s part of the common-core curriculum to phase out cursive in favor of digital skills. I disagree. According to the WSJ, which has a good piece on writing in cursive, it’s still an important and relevant skill. It’s even good for aging adults and helps with learning, memory, and ideation. Ironically, the article cites a study in favor of cursive writing from Indiana University. There are several debates going on. One is that teachers who do believe in cursive, have certain preferences as to what ‘style’ of cursive is being taught. Now that, to me, is simply a debate about aesthetic preferences. We do no write in the same script Thomas Jefferson did when he wrote the Declaration of Independence. The second debate is whether or not cursive writing itself is irrelevant. Some educators believe it should go the way of the dodo bird. Others, like me, believe it should be taught. I have no problems with children reverting back to printing later on. For struggling writers, cursive allows them to be more fluent and thus lets their ideas flow on the page more readily. If you integrate penmanship with other literacy activities, the formation of letters really does make a difference in the way kids retain information. Even in a one-to-one laptop school, teachers ask children to write a lot by hand (journals, responses to prompts, note taking, etc.). My school is not a one-to-one school, and I don’t think it needs to be. Pre-K students do not need their own devices. The ‘worry’ about kids not being able to type is a silly one. I didn’t learn how to type until I was in college (yes, I know I didn’t need it in the era I grew up), but with a simple software tool, I taught myself and was typing about 90 words a minute in two weeks. Sure, I barely use cursive now. Emails, these blog posts, report cards, texting, etc. are all part of today’s reality. And it depends on the situation. On my laptop, I’ll type. But even on my Ipad, I prefer using a stylus and taking notes by hand, even though my cursive (once beautiful) is barely legible. Kids will drop cursive writing if they see its need go away , but that’s not the point. It’s what they’re learning simultaneously when engaged in learning cursive. Purposeful formation of letters has to have some intrinsic value, let alone stimulate all kinds of connections in the brain. When, for example, do we stop teaching kids how to tell time on an analog clock? Even though I haven’t worn a watch in the past 6 to 7 years, I hope the answer is never. If nothing else, reading dials is an important skill. 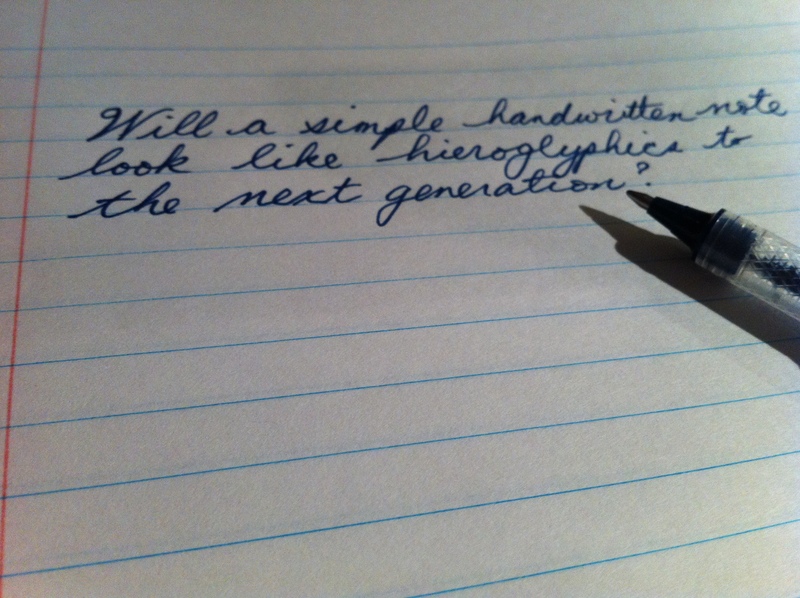 Will a simple handwritten note look like hieroglyphics to the next generation? Last week, as part of our school’s way of looking at teacher growth, I sent in a written reflection of my goals. This coming week, I will be asking my students to reflect on their progress this year, assess how they perceive their growth, and perhaps even set new goals for the summer. I feel fortunate as the place I wanted to visit most before I died was the place I was born and left 30 years ago. 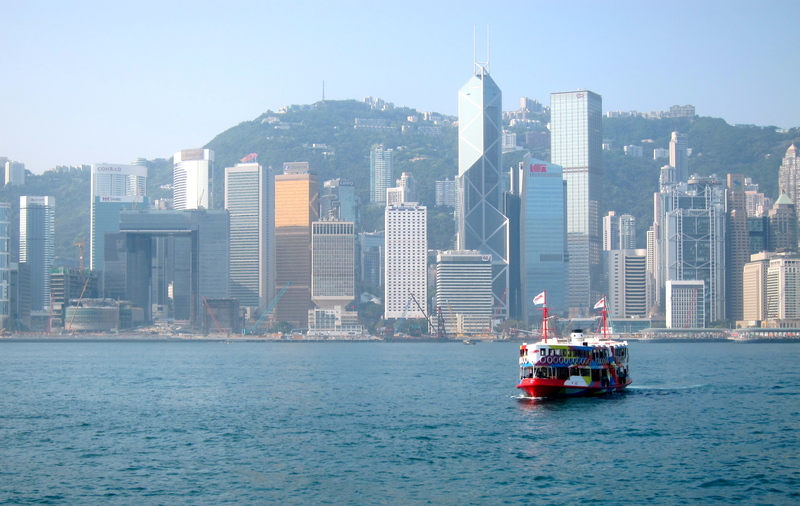 I had a chance to do that this Spring Break: Hong Kong, China. What did it take to get there? A former friend, colleague, and mother of a child I taught moved to teach at the HK International School. Aside from wanting to visit, I now also had someone to visit. I enjoyed every bit of that week. How can I change the homework policy at school? I’ve produced the research showing that it doesn’t make a difference in lower elementary school. I’ve looked for the “research” that says it does – there is none! (not for second grade and below) The studies that have been done show that there is no benefit of homework in the lower elementary grades. Many of the researchers may add on, “Homework should help them develop good study habits, foster positive attitudes toward school, and communicate to students the idea that learning takes work.” Cooper (1989) – Ok Mr. Cooper, so you’ve looked at all the research and find that “it should not be expected to improve test scores,” but you recommend it anyway for reasons that have nothing to do with the research you looked at. Then there’s the research regarding practice of a skill. It’s pretty obvious that practice makes a difference. But practice and homework are two different things. There is no guarantee that your student is learning anything if they don’t see the purpose behind the practice and don’t get immediate feedback. If there is one kind of homework I would assign, it would be that a student should read each night or be read to. That is something that many researchers have found to be effective. I’ve asked the school to change the policy and will do so again. I wrote an article that got published last week about this issue. Some folks say, the research is out there. The only thing I’ve found is that reading to your child and practicing a skill makes a difference. If there is no one there to coach them while they are practicing, though, what good is the assignment? I have yet to have one of those folks bring me a piece of research that concludes homework in second grade and lower makes any difference. I’ve asked to see this research. I’ve chosen not to dwell on the past (the policy hasn’t changed) – I may the only person who has this belief (I’m not…just the most vocal one), but I can still have faith in my conviction and, while change didn’t happen, I can continue to try and influence change in the future. I don’t believe in ‘feelings’. If the evidence shows there’s no noticeable effect, I will keep asking the question, why do we do this? Because some parents ‘feel’ its important is not a good reason. I will keep persisting on this matter. I believe that if we ask our students to take risks, we (teachers, parents, staff) have to do the same. I can safely say, I’ve taken several risks this year – these included successes and failures (learning opportunities sounds better though). 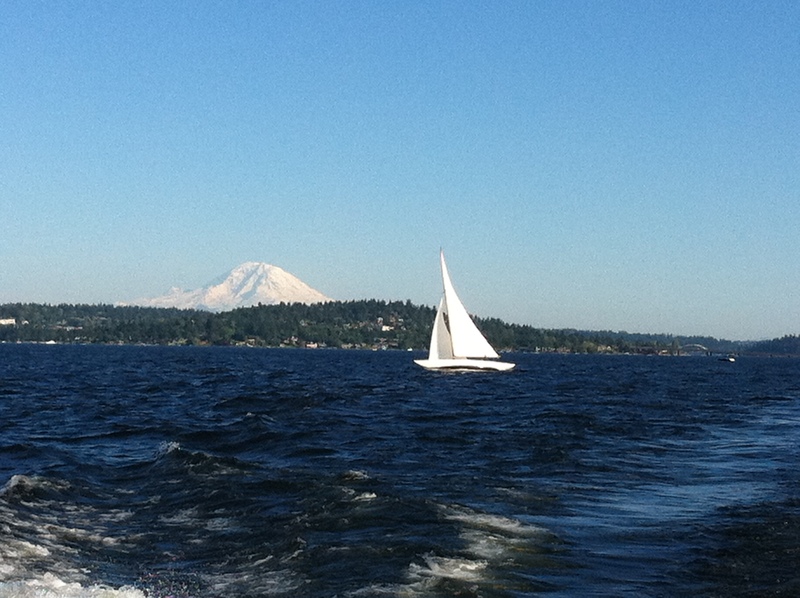 It was a breathtaking day on Lake Washington spent with people I care about. Being a reflective practitioner is something I need to get better at. Can I keep up with one prompt per day? We’ll see. June is shaping up to be another very busy month. Recently, my head of school suggested that he was almost ready to take a leap and start blogging. He just needed a little nudge. Hopefully this post will help. 1) Decide on purpose: to share what you’ve read both to teachers and parents, to share resources, to highlight your school, to be reflective and tell stories about the realities of school life, for personal professional development, to take a risk, to learn, etc. 2) Keep it related to education. – I’ve heard that nobody wants to read about what you had for lunch (unless of course it somehow relates to school). 3) Not everyone will like what you have to say (or care) – that’s okay, some will. These three hosted a session called “Blogging Heads” at the last NAIS conference in DC, which I followed remotely. You can read a summary of their panel discussion here. 7) You don’t have to write every day. 8. It’s a way to responsibly model an authentic medium that many of our students will or already use. 9) You may reach people well beyond our own school community. 11) Like those other disciplines mentioned above, don’t do it for extrinsic rewards. The intrinsic rewards should be good enough. 12) Don’t always expect comments or replies. 13) Don’t expect all your teachers to blog. Do encourage them to be reflective about their practice – whatever form that may be. Blogging is not part of a teacher’s job. It’s just one of many ways to share. 14) Realize that sometimes, you have to stop, and even though you set out to write 15 tips, sometimes 14 will do. A nudge was asked for. The book Nudge is a book about the psychology of choices. The philosophy called libertarian paternalism is what the authors of the book say works best in designing choice architecture. I’m just a teacher who likes to think about education and share what I’m thinking: I’m not a philosopher, psychologist, or even a Head of School. To blog or not to blog? I’ll keep you posted. Will I Pay for the Gray Lady? This past week, the New York Times revealed its plan to charge consumers for its content. It’s continues to be an interesting time for newspaper organizations who cannot survive on advertising revenue alone. The quality of the content is what separates whether something is worth paying for or not – regardless what niche that is, be it news, education, or something else. “the tension of publishing “polished,” pretty, and beautifully composed pieces meant for wide public consumption vs. writing off the top of my head, providing transparent “think-out-loud” pieces sharing what is very much a thinking work in progress. I don’t get paid for blogging. I do it for many of the reasons Martin lists in his article: “Why I Blog: A Principal’s 13 Reasons“. I don’t have editors, and sometimes when I go and re-read an older post I wrote, I wish I did. If you want quality journalism, the reporters and writers who do it for a living, need to be paid. The reason why Wikipedia works, is because it is simply a collection (for the most part) of facts. It lacks analysis, evaluation, and quality writing – something I’d be willing to pay for. The NYTimes metered pay-wall model is an interesting one, though. Can a digital subscription be shared in a household like a physical paper? Is the app version of the content going to be so superior to the website, that it’s worth $240 more a year to read it on my phone and tablet via an app? Then there’s the dilema of subscribing to the paper edition, which for new subscribers, is offered at 50% off the newsstand price for the first 12 weeks. The paper subscription will give you full access to any form of the digital content including the app versions. If you only subscribe to the M-F edition, it actually works out to just about $15 a month, same as the basic digital plan. You end up with the app versions for less, but you also end up with a lot of paper to recycle each week (at least for the first 12 weeks). I don’t know what the answer is, but I’m interested in how this will play out. For those who read my blog, thanks for putting up with the flaws in my writing and opinions. I’m just happy you visited. Most innovations come about as a solution to fulfilling a need or solving a problem, usually making something more efficient and simple. I have yet to find a tweak to simplifying the process of writing narrative report cards. Capturing a child’s progress is not a simple task. This time of year, most teachers have plenty of observational notes, anecdotes, assessment data, and student work which they refer in order to 1) communicate a child’s progress to a parent, and 2) have a written record of it. Because each child is unique, each narrative also has to be. Taking all that information, synthesizing and organizing is not an easy task (at least not for me). In addition, I also find writing mid-year reports more difficult because you’re referring to a child’s past and present performance, and also suggesting what you and the child’s family can do to help their child grow in the near future. Trying to keep all those tenses and modes in check is not one of my strengths. I also struggle with using the active voice consistently. It feels too direct sometimes. Finally, there’s the use of commas, hyphens, and other punctuation dilemmas. Do you hyphenate the term high-frequency words? I’ve seen it both ways in published books. I think it’s a compound adjective, and turning to Strunk and White, they say that a hyphen is “usually required.” They don’t give an example of when it’s not. Nonetheless, narratives are important ways to communicate progress, and I haven’t figured out how to make it simpler. A checklist, boiler plate paragraph, letter grade, or numerical score is simpler, but doesn’t capture the child in the same way. This article in yesterday’s New York Times talks about innovation coming from do-it-yourselfers eager to share their tweaks freely online. This being a change from innovations usually coming from large consumer companies. Unfortunately, none of the innovations referred to in the article were related to writing progress reports. It does link to an interesting innovation: how you can make your own $10,000 book scanner for $300. In a way, the internet can be a source for collaborative design thinking. Narrative reports are a lot of work, but I’m glad I’m not at a school that simply hands out letter grades based on test scores simply because it’s an expedient way to sort kids. Still, if there are any innovations out there on this process, I’m all ears.